Terry cloth towels have the ability to absorb larger amounts of water than normal towels. As with other towels, your terry cloth towels should be washed every time you use them. Simply washing and drying your terry cloth towels as you would other laundry could damage them and other items. Place the terry cloth towels into the washing machine. Do not add other items to the washing machine. Pour 1 cup of a mild laundry detergent into the machine. Run one warm-wash machine cycle. Remove the items from the washing machine, and place them in the dryer. Dry the terry cloth towels on tumble (no heat), as heat could damage the terry cloth. Avoid washing terry cloth towels with other items, as terry cloth is likely to “lint” or shed during the cleaning process. 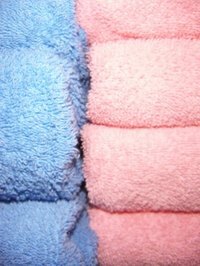 Avoid bleach and fabric softeners when cleaning terry cloth towels, as these both can damage the items. Can You Wash Towels & Pillowcases Together? How Often Should You Change Towels After a Shower?